Graveyard Point Plume Agate from Eastern Oregon. Cutting and photo by David Vance Horste. Courtesy DVH Designs. 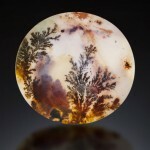 Plume agate is yet another beautiful agate patterned with inclusions. These look like plumes of smoke or clouds—hence the name. 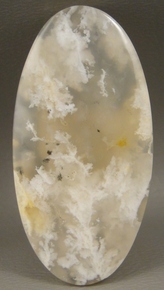 Often the agate surrounding the inclusions is translucent. If cut so that the surface is at a diagonal to the plumes, they appear to rise from the depths of a great ocean to burst on the surface. If cut parallel to the plumes, the patterning can be flame-like. And if cut across the plumes, the patterns are like ribbed disks or starbursts. Truly a versatile stone! 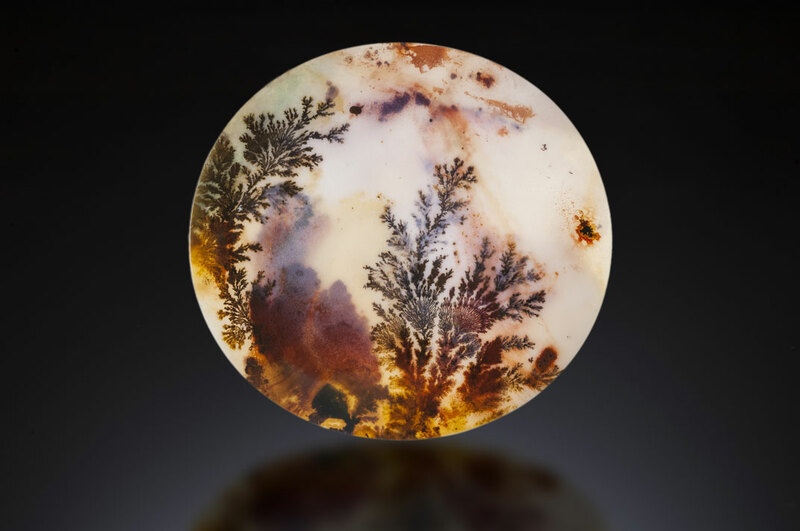 The inclusions in plume agate can be just about any color, from white or gray, to yellow, orange, pink, green, bluish or bluish-green. 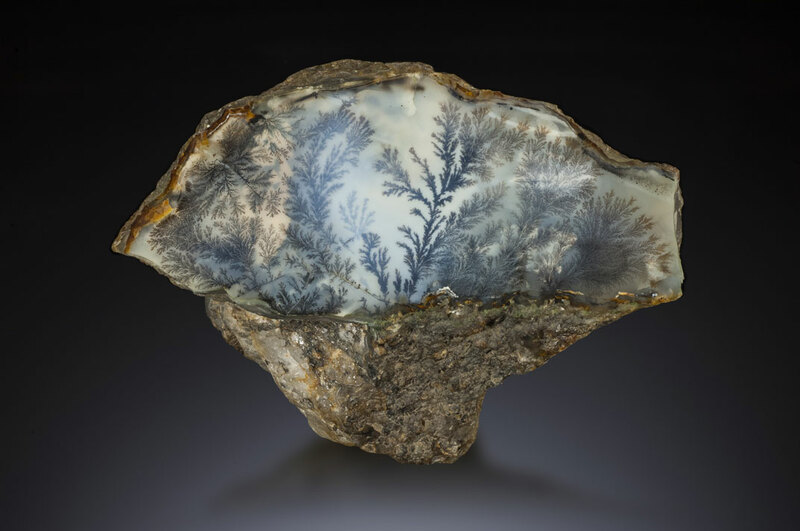 One of the most appreciated is Priday Plume Agate which came from a site in eastern Oregon. It has since played out, but sometimes you can find old pieces. The plumes of Graveyard Point Plume Agate are almost golden in color. Brilliantly colored orange and yellow plume agate is found in Indonesia. Plume Agate, Stinking Water, Oregon. Photo courtesy Barlow’s Gems. The beauty of plume agates can be enhanced by setting or stringing them with stones or beads of similar or complementary colors. Some bead artists even combine them with hand-made ceramic beads. How much does it cost? 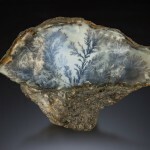 Like other patterned agates, each plume agate is unique. Prices can from $15 a stone to $150 a stone. (The price may depend on source name—such as the sought-after Priday. However, judge the quality and price of a stone by the attractiveness of its patterning, not by the name of the mine.) Strands of beads run approximately $10 to 15 per strand; large single beads can cost $5 and up. Rough plume agate costs $15 to $25 a pound. Plume Agate, courtesy Indus Valley Commerce. How hard is it to find? Plume agate is available online and at shows. However, beautifully patterned, well-cut material may be more difficult to obtain. What kind of jewelry can I put this in? All agates are tough and durable. They take and hold a high polish. They can be worn in any kind of jewelry—even belt buckles, cufflinks or bracelets that take heavy wear. How easy is it to set? Very easy. Beware of buying stones with thin, sharp edges, however, which can chip during setting. What are best settings for this stone? 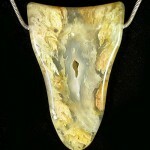 Bezels are the most common setting method for agates. As long as they are of suitable thickness, stones may be set with or without a backing due to their toughness. However, some plume agates may have a faceted edge, lending themselves to prong setting. 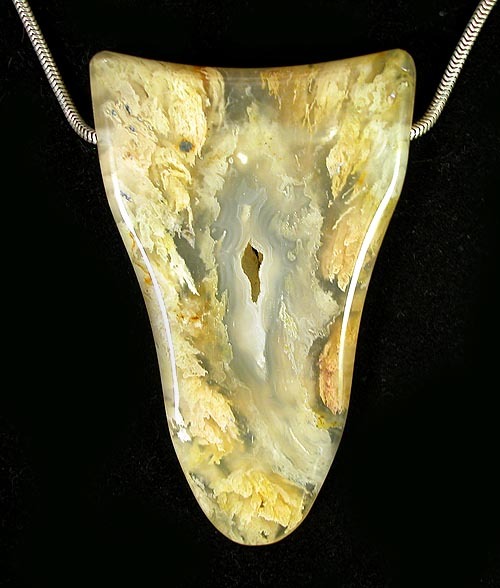 Artisan/studio dos and donts Avoid thermal shock which can crack agates and other quartzes. Keep them out of the sonic to avoid enlarging invisible fractures. Take care when setting stones with thin edges. Wearer dos and donts Although agates are hardness 7 on the Mohs scale, they can be scratched by harder materials, such as sapphires, garnets, topaz, and diamonds. Avoid storing agates in ways that these other stones could come into contact with them. First published in Lapidary Journal Jewelry Artist March 2012.